There's a good chance that you've already tried this product and don't even know it. The company's Original Pancake & Waffle Flour has been around since 1937. Since that time, it's been the secret ingredient in the pancakes and waffles of many upscale restaurants, hotels, resorts and even some colleges. Only recently has the flour become more widely available for home use. You can now find it at several specialty retail chains like William Sonoma and Cost Plus, and it's also become available online at Amazon.com. When I first saw this product, I asked myself, "What the heck is Pancake & Waffle Flour?" To my regular-guy mind, flour was flour... you buy it in five pounds bags, mix it with eggs and milk and presto... breakfast. What makes this specialty flour so "special"? 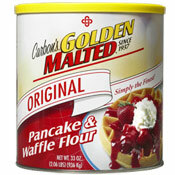 Carbon's Golden Malted Original Pancake & Waffle Flour is not a pancake mix. You can't just add water. The directions to make pancakes or waffles with it are roughly the same as making them with standard flour minus the baking powder or baking soda. You mix it with egg, butter and milk and/or water. So what's so special about that? In this case, the proof is in the pancake. This flour really does makes great pancakes. As the name implies, there's a distinct malt flavor. While ever-present and enjoyable, I liked that the malt takes more of co-starring role when maple syrup or other toppings are added. The flavors in the flour combine to create pancakes with a family recipe feeling. People won't say, "These are great malted pancakes." They'll just say, "These are great pancakes." One of my favorite aspects of the end pancake was the uniformity of browning. I make a lot pancakes from scratch and their taste and texture can match up pretty good against these specialty flour pancakes. But when it comes getting that perfect golden brown appearance, I have to give it up to these guys. Every pancake, every time was golden brown throughout. As for waffles, this flour does a respectable job. The flavor, as above, is terrific. I would have liked to have seen a bit more crispness to outer edge. I followed the recipe on the package exactly. Next time, I may add a bit more butter than they suggest and see if I can produce optimal crispness. One interesting note about the waffles: I have a favorite ladle I use to make waffles. Each ladle full of batter is the perfect amount of batter for my waffle maker. When I used my favorite laddle with this batter, it proved to be too much and some batter overflowed out of my machine. It's a strange phenomenon. I have to think their levening agents are bit quicker acting than standard baking powder. So for those of you with a favorite waffle-batter-ladle, now you know. Before I give you the bottom line, you should know... I wanted like crazy to like this stuff. The company sent me a lot of it to sample. I felt like I was on a game show and won a year's supply. I hoped like heck that it wasn't a year's supply of garbage. Fortunately, I was impressed. But you should know that your buddy Mr Breakfast may have been slightly influenced by the company's generous shipment of samples. The Bottom Line: This flour makes excellent pancakes. If you can find it and the price is reasonable, definitely give it a try. What do you think of Carbon's Golden Malted Original? I have used Golden for about 5 years and have absolutely LOVED it until the last time I ordered... the mix did not come in the tin. They now put it in bags, which was fine. The worst part is that it is not the same mix. Unfortunately, the taste and even the smell is not the same. Even my husband who will eat almost anything wanted to know what was wrong with his waffle. They lost me as a customer. I ordered their products every year for Christmas presents. One year, when we opened a canister there was a piece of machinery in it! Customer Service was horrendous. No apology, and a refund of $2 if I didn't order the same flavored product. I no longer order from this company. I've been enjoying Carbon's waffle/pancake flour for the better part of 10 years now. It is just fantastic. I first encountered Carbon's at the Grove Park Inn. I now, after years of searching, have my own genuine Carbon's waffle baker/iron that makes the mini Belgian waffles. This baker is big-time heavy duty and was quite the find. I love it, and I make Perfect waffles for my family of 8 almost every single weekend. I've tried them all, and Carbon's flour is the absolute best! I work at a hotel and we serve Carbon. We mix it with purified water so I'm not sure why carbon waffles have a horrible after taste. They are get soft really quick (even when you cook them longer). The batter smells really good though. Honestly if you look in our trash can during breakfast hours you will see a lot of waffles. We are switching to heartland. Great stuff. Worth paying a little more for it. The flavor is a lot better than other mixes in a box. Has anybody had a chance to compare the Carbon's Just add water mix vs the Original mix (requires eggs and butter)? Which mix do hotels/business use? Also, Jim Pedersen or anybody who owned/owns a Carbon's IRON. Which IRON makes better waffles the newer automatic maker with non-stick coating grids or the older classic style with heavy cast iron base with a manual dial. I lOVE... did I say I LOVE... Waffles!!! This product is the world's best! Light, but crispy. It's worth going out of your way to get it. Ask for it at your next hotel stay. I travel the eastern US and it's everywhere. Better than Heartland. I have to order this online because no stores in my area stock it. It's worth going out of your way to find this mix. It makes the best waffles - fluffy, but crispy on the outside. You can buy it at World Market if there is one in your area. Not overly expensive. Haven't had pancakes or waffles made from them in years, but they originated in my hometown of Buchanan, Michigan, so I know they are the best!! I LOVE waffles and this brand makes the best waffles I've ever had. So glad Amazon sells the mix as I will be purchasing it! My wife and I formerly owned and operated a bed and breakfast operation on the Island of Hawaii. We frequently made and served Carbon Belgian waffles and they were always a hit with customers that came from every continent in the world. We typically added more cinnamon and nutmeg to the mix, and served the waffles with toppings that we made from local poha or ohelo berries. We had good repeat business at our B&B, formerly known as Volcano Bed & Breakfast, and I think the use of Carbon waffle mix played a part in sustaining many of our customers. I had this batter at a hotel and I thought it was better than waffle house, and way better than grocery brands. I'll be on amazon to get my own! Love this stuff for waffles. Best mix I've found so far. Crisp edges, fluffy middle, awesome. I stayed at two different hotels this week and they both had waffles to make. There were two different kinds. Heartland and Carbon waffles. I prefer the carbon's waffles much better. There was no special taste in the heartland waffles, just seemed like Aunt Jemima or something from a grocery store. I don't know if this helps any but carbon's waffles are far superior! Outstanding waffles and pancakes indeed! Looking for a little extra crispness and lightness? Separate your egg yokes from the whites, mix the yolks and water as usual. Then whip the whites until stiff peaks form, and fold into final batter mix before cooking. Heavenly! I've tried this stuff but find that Heartland Food Products version is much better. This stuff is good but Heartlands stays firm as this stuff gets soft. My favorite waffle is from Waffle House. But, it gets expensive going there often. This mix is the closest that I've found in flavor to Waffle House and it is a lot cheaper than going to the restaurant. I definitely beats your regular grocery store mixes. 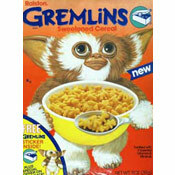 And you can order it directly from Golden Malted. Enjoyed at the Ritz Carlton in Cancun Mexico - did not know the "secret" recipe, but they gladly shared with me. Now, I am ordering my own stash! If you guys like this stuff Heartland food products makes one even better I promise. Never heard of it, stumbled on it in an international foods store in College Station, TX. I bought it because I was intrigued by the "Golden Malted" part of the label. Made pancakes this morning for my family. I use a cast iron griddle and they looked beautiful and tasted wonderful! We're hooked! PROS: This is a really good tasting product. CONS: It's expensive and can be hard to find. I LOVED the pancakes I made with this. If you can find it - I suggest buying some of their specialty flavors. My favorite is pumpkin - which has only a mild pumpkin taste. It doesn't overpower the pancakes at all. They're never chewy or spongy like some mixes - perfectly tender - like an actual slice of cake! Delicious! I have tried different kinds of waffle mixes and none compares to this one. I have only tried the original kind. I add a little more water, 1 extra egg and some cinnamon and vanilla extract. The waffles are much more lighter and crispier and tastier too! Best waffle mix I had so far.